Earthquakes make and break the stunning scenery of Jiuzhaigou, creating a kaleidoscope of breathtaking colors and formations. In 1966, a group of lumberjacks ventured into a remote part of Sichuan Province and were stunned by what they saw. The Y-shaped Minshan Mountain and lakes of dazzling shades of blue and green in verdant valleys spread out before their eyes. The water glistened like turquoise under the sun. In the 1970s, a scientific expedition found precious plant and animal resources in Jiuzhaigou, and the area was established as a natural reserve. A decade later, it was opened to the public as a sightseeing resort. Since then, millions of people have tramped over hill and dale to marvel at this wondrous site, enveloped in the mystery of the Tibetan culture. The landscape is so unique that the area was listed as a World Heritage Site by UNESCO in 1992. But what lies beneath this wonderland is less tranquil. Jiuzhaigou sits on the Minshan seismic belt. In August 2017, it was rocked by a magnitude-7 earthquake that destroyed part of its iconic scenery and closed the area to the public. But nature both gives and takes. Earthquakes have also created the scenery of Jiuzhaigou. The tourist area was partially reopened to the public on March 8, and a few new features have been formed by the Earth’s upheaval. The Aba ethnic people tell a myth about how the lakes were formed: Two mountain deity, the god Dage and goddess Semu, fell in love. Dage gave a magic mirror, made of clouds and winds, to Semu, but she accidentally dropped it. The mirror broke into hundreds of shards that became lakes and ponds. In actuality, most of the lakes and ponds in Jiuzhaigou are barrier lakes formed by earthquakes and landslides, and the water is actually melted snow flowing from the Minshan Mountain. The rich mineral content of the pristine melt water creates a kaleidoscope of colors under sunlight. The melted snow first flows into Long Lake, the largest and highest lake in Jiuzhaigou. From there, it is channeled to other lakes through natural underground waterways. Long Lake has no visible outlet, but it never floods or dries out. Long Lake is usually the first stop for visitors. From there, they can walk down to other lakes and waterfalls. Sparkling Lake nearly lost all its water after a large breach created by the earthquake. But after six months’ restoration work, the lake has returned to its usual state. In sunlight, its waters glisten like jade. 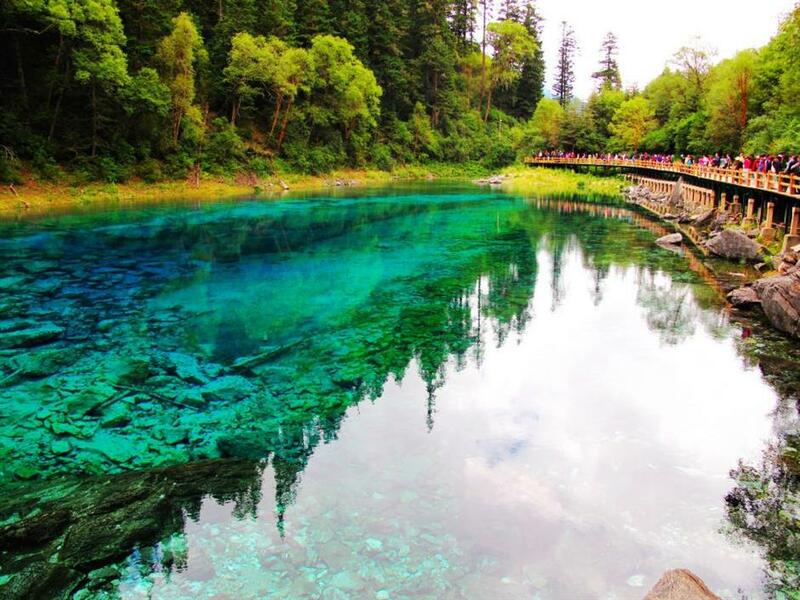 Five-Colored Pond, smallest in Jiuzhaigou, mirrors many colors. Mirror Lake looks just like its name. Two other bodies of water, Five-Colored Pond and Mirror Lake, were not seriously affected by the trembler. 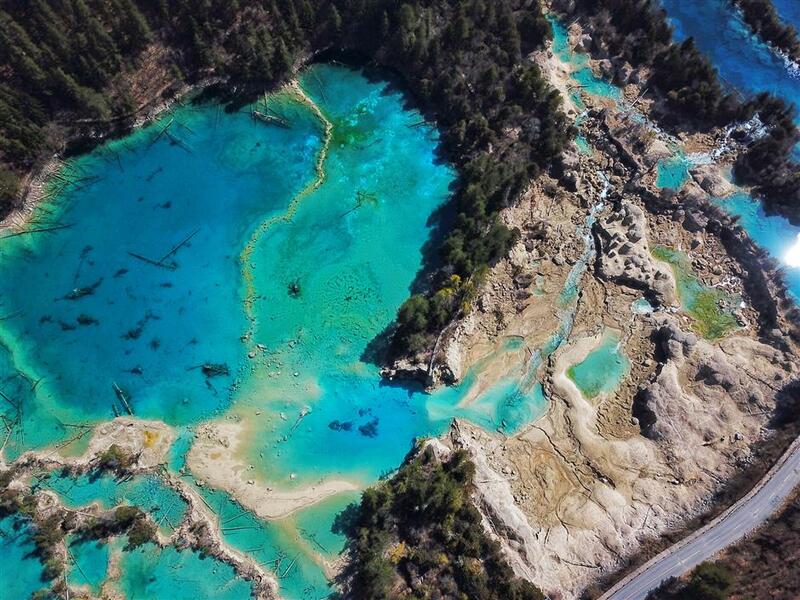 Five-Colored Pond, smallest in Jiuzhaigou, is an array of colors — a vivid blue in the upper part, orange and red in the lower, azure on the left and olive green on the right. Various aquatic plants grow in the pond, and their chlorophyll helps create different colors in water rich in calcium carbonate. This pond is the only one that doesn’t freeze over in the winter because it is fed with warm water from Long Lake that has flowed through underground karst caves. Mirror Lake looks just like its name. Its tranquil, clear surface is like a mirror reflecting the sky and nearby mountains. Local legends say that after Semu lost her magic mirror, she went to Mirror Lake to dress every day. The site was a romantic setting for her and her beloved Dage. An ancient vine tree still stands by the lake. Local people regard its entwined vines as a symbol of eternal love. The best view of the lake is said to be between 9am and 5pm, when the reflections form an impressionist painting. 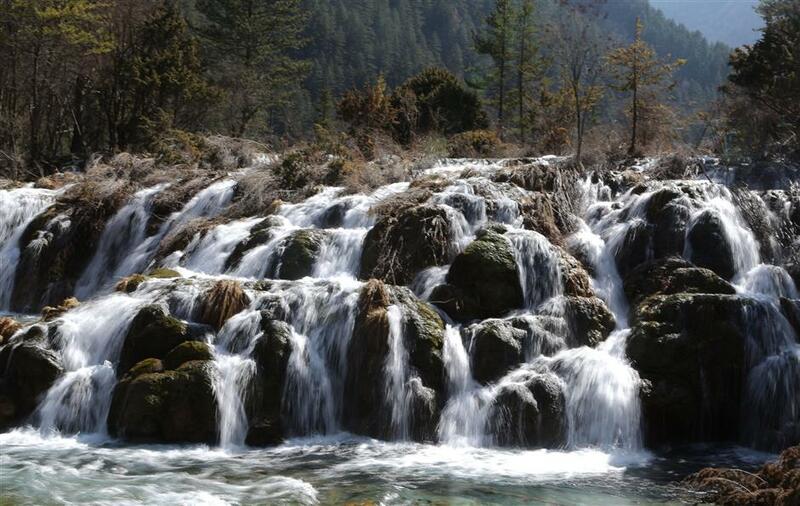 Before the earthquake last year, there were two main waterfalls in Jiuzhaigou — Nuorilang Falls and Pearl Shoal Falls. Nuorilang Falls has reopened, but Pearl Shoal is still undergoing restoration work. 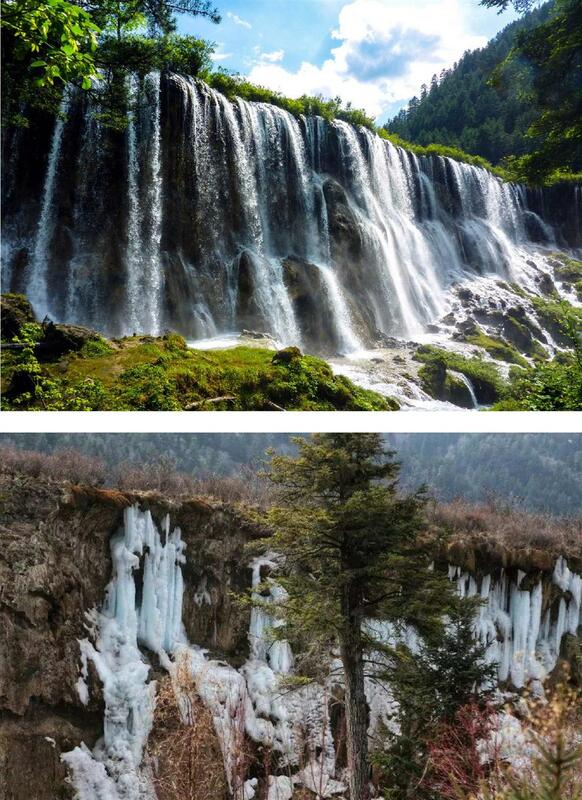 As the widest cascade in China, Nuorilang Falls presents different views in different seasons. In the spring, when the water level is not too high, the water looks completely transparent amid a setting of newly sprouting leaves. But if visitors want to see a torrent gushing down from the mountain, they have to wait a few months for more snow water melt from the Minshan Mountain. The most beautiful view of the falls, however, comes in the autumn as the leaves turn color. The pure white water flow makes the flaming autumn leaves look brighter. But that view ends with winter, when the waterfall freezes over. Visitors to the area will discover a new waterfall created by last year’s earthquake. It’s called Double Dragon Falls because it sits above the Double Dragon Lake. The new cascade was formed by water pouring out of Sparkling Lake to Double Dragon Lake through the breach caused by the earthquake. A new plank road has been built there to make sightseeing easier. The new Double Dragon Falls was formed last year by the quake that sent water spilling out of Sparkling Lake. The temple, which is a typical Tibetan Bon traditional holy shrine, has a history of more than 1,000 years. The current temple, however, was rebuilt only about 30 years ago after the original structure was destroyed during the “cultural revolution” (1966-76). The original name of the temple meant “the holy land of auspiciousness and completion,” but after the old temple was destroyed, the site was given to nearby Zharu Village and the name was changed. There are several Tibetan villages around the temple. Every year, the locals celebrate four Tibetan Buddhist ceremonies to worship Tonpa Shenrab, founder of the Bon tradition. A relic of the guru is enshrined on the top of a tower in the temple. The earthquake last year cracked some walls and loosened some foundations, but after half a year’s restoration, safety hazards have been repaired. 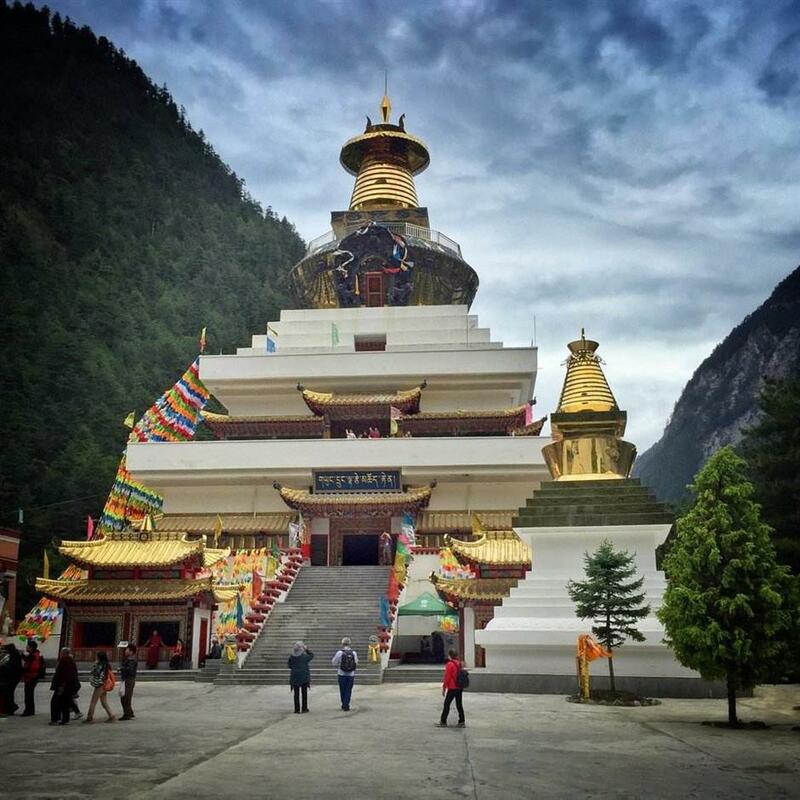 Close to the entrance of Jiuzhaigou scenic area, Zharu Temple is a typical Tibetan temple that embraces the Bon tradition. Since reopening, Jiuzhaigou accepts a maximum 2,000 visitors a day. People need to buy tour packages from travel service companies. Individual visitors are temporarily barred. Several online travel agencies, including Ctrip (www.ctrip.com), Lumama (www.lvmama.com), Tuniu (www.tuniu.com) and Tongcheng (www.ly.com), offer Jiuzhaigou-related packages departing from Shanghai. According to a statement released recently by the Aba Prefecture tourism authorities, admission to the scenery area will be 40 yuan (US$6.30) until the end of March and from November 16 to the end of the year. In the other months, admission is 110 yuan. About 100 kilometers from Jiuzhaigou lies the only well-preserved plateau wetland in China. The Huanglong Scenic and Historic Interest Area offers a panorama of steep mountains and colorful ponds. The main valley, Huanglong Valley, is shaped like a sleeping dragon, making it one of China’s geographic icons. In 1992, the scenic area was inscribed on UNESCO’s World Heritage Site list. Multicolored Ponds at the higher end of the valley is the most sought-after site by visitors. The snow glows white on Mount Xuebaoding, the main peak of the Minshan Mountain, which casts different colors on 693 small ponds. About 4.1 kilometers from the entrance of the scenic area, a cable car is available, but visitors still need to walk for about 2 kilometers to reach the ponds. On the plateau nearly 5,000 meters above sea level, even a 2-kilometer walk can be an exhausting challenge to some people, but the breathtaking scenery of the ponds is worth the breath-taking trek. Scenic area officials said the views and facilities of Huanglong were not damaged by last year’s earthquake. How to get there: Buses to Huanglong Scenic and Historic Interest Area depart from the Jiuzhaigou-Huanglong Airport. The whole trip is 43 kilometers. 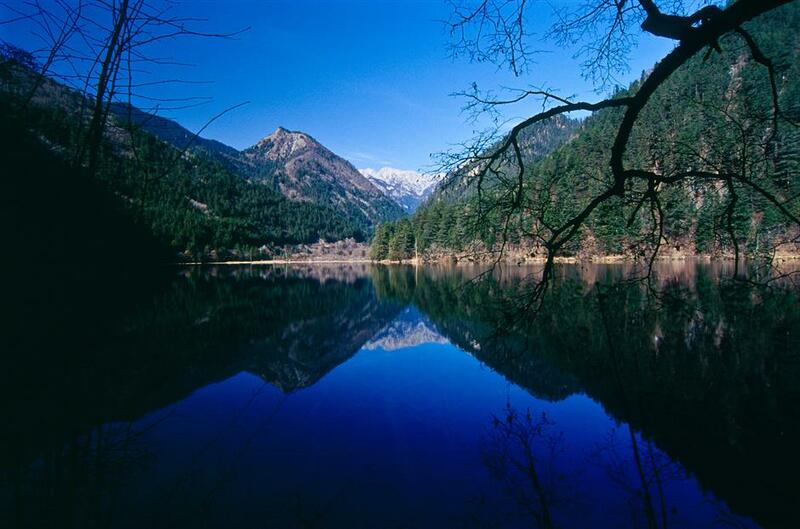 Travel agency tour packages to Jiuzhaigou usually include the Huanglong scenic area. 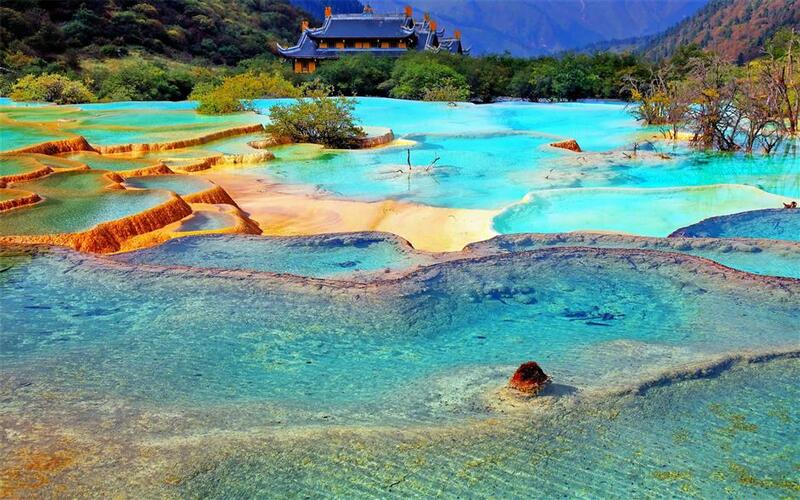 Multicolored Ponds at the higher end of the Huanglong Valley is the site most sought-after by visitors.